Excellence, like quality wood, is not just a chance finding, it is something that must be searched out day after day. Only then is it possible for a company to evolve from a sawmill to a leading global manufacturer of laminated hardwood beams. For over seventy years, being faithful to our values has enabled GÁMIZ GROUP to turn them into tools that have made us a reference in the premium quality wood sector. The spirit of continuous improvement needs to be fed with innovation, which requires people who generate ideas and high tech to implement them. This symbiosis, together with the use of noble woods such as oak, beech or ash, has allowed GÁMIZ GROUP to achieve perfection in its main objective: to obtain the highest quality wood products on the market. Products such as oak glulam beams, laminated profiles, edge-glued panels, whose highest quality is certified by the group’s own manufacturing processes, which also firmly believe in sustainability and commitment to the environment. Thanks, precisely, to our investment in R&D+i, for example, we minimize our raw material waste and convert it into heat for our dryers. Furthermore, the companies that are part of GÁMIZ GROUP hold the most important responsible forest management certificates in the sector (FSC Certified Elaborados y Fabricados Gámiz, PEFC Certified Elaborados y Fabricados Gámiz, PEFC Certified Maderas Gámiz). This is the company with the greatest added value in the group. Here is located the company’s R&D+i department. It specializes in the development and manufacture of laminated wood products such as laminated profiles (PERFIGAM), edge-glued panels (ALIGAM) and glulam beams using European hardwoods (VIGAM). In recent years a local wood, insignis pine (pinus radiata) has been incorporated into their products. Likewise, they are the official distributors of ACCOYA® acetylated wood in Spain. With offices in the Basque Country and Madrid, it is dedicated to the supply and on-site laying of all types of flooring and derivatives. With more than twenty years of experience in the sector, its infrastructure allows it to be involved in major project contracting and work with the most prestigious construction companies in Spain. It has its own and highly qualified teams and offers an after-sales repair service for flooring which has been previously fitted. It exclusively commercializes premium high quality products, such as exclusive composites and high-tech flooring. Exclusive distributors for Spain of GEOLAM Wood Plastic Composite (WPC), and its new product, GEOLAM Premium Wood Hybrid System (WHS), profiles that combine composites with aluminium, manufactured by the company EINWOOD (Japan), and TAG (High-End Flooring). The origin of GÁMIZ GROUP. 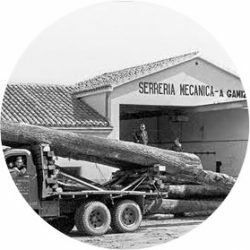 Maderas Gámiz transforms a total of 30,000 m³ of oak, beech, ash, sycamore and other hardwood timber at its facilities. 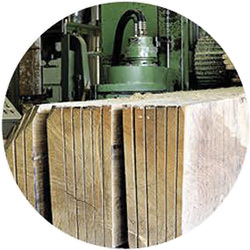 Here the quality sawing processes, optimization and drying of the wood are undertaken, as well as its subsequent conditioning for sale. In addition to the wood for our own products, the company offers, made-to-measure pieces and edged panels. Staves for wine barrels are also elaborated. 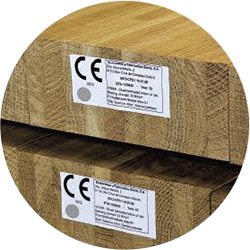 GÁMIZ GROUP is the first manufacturer worldwide to obtain the CE marking for structural use of oak glulam beams (June 2013). Since then, our manufacturing process is controlled and supervised externally by the prestigious German centre, MPA Stuttgart, Otto-Graf-Institut. In addition, GÁMIZ GROUP has recently incorporated glulam beams, using local insignis pine (pinus radiata), premium-quality beams aimed at high demand applications and curtain-wall facades. Since the beginning of 2010 GRUPO GÁMIZ has held the prestigious quality certificate of the FCBA (France), CTB-LCA marking, for the elaboration of our oak, beech and pine laminated profiles. This means that, in addition to our own internal controls, our manufacturing process is monitored by this external, independent institute, which guarantees our customers the highest quality in our wood products. GÁMIZ GROUP companies have been PEFC certified since 2005, the most widely implemented forest certification system in the world. The objective of PEFC is to ensure that the world’s forests are managed in a responsible manner. – PEFC Certified Maderas Gámiz, S.A.
– PEFC Certified Elaborados y Fabricados Gámiz, S.A. Since 2012 GÁMIZ GROUP has held the FSC® certification (Forest Stewardship Council), an evaluation process to which the forestry company or company voluntarily submits, and which is carried out by an independent certification body through field audits and consultations. 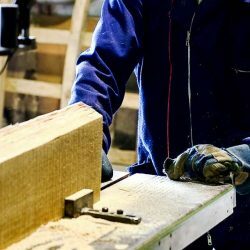 – FSC Certified Elaborados y Fabricados Gámiz, SA. 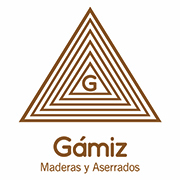 Maderas Gámiz started out as a company dedicated to forestry, coal extraction and the commercialization of timber. The first sawmill was set up in Santa Cruz de Campezo. Another sawmill was acquired. 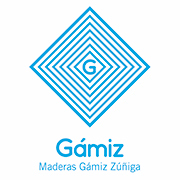 The scope of action of Maderas Gámiz grew with the beginning of the manufacture of parquet and the veneer production process. A new sawmill was installed and new production methods and more advanced techniques were introduced. 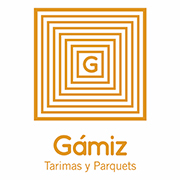 A third company, Tarimas y Parquets Gámiz, was incorporated to provide a more extensive range of service with the installation of all types of wooden floors. 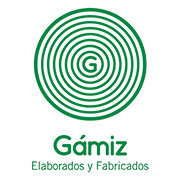 With the creation of Elaborados y Fabricados Gámiz, a great qualitative leap took place, by starting to manufacture more elaborated, innovative and high-added value wood products. GÁMIZ GROUP continues to advance continuously, implementing new technology and new machinery, and bringing new products to the market. Obtaining quality certificates and the importance of the R&D+i department mark the profile of the group and outline the lines along which the future of the company will be strengthened.